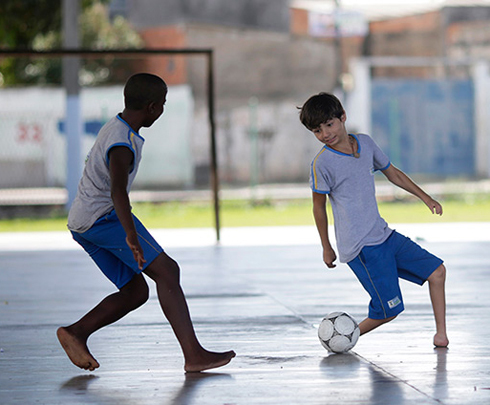 Defying a Disability: 11-year-old Gabriel Muniz is considered to be one of the best young soccer players among his age group in the the city of Rio de Janeiro, Brazil. But this young talent isn’t making headlines across the world for what he can do “with his feet”, he’s making heads turn for what he can do “without them”. Yes, you read that last sentence correctly. 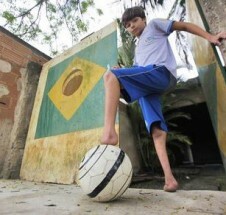 No need to adjust your computer screen, 11-year-old Gabriel Muniz was born without feet but has been walking since age 1 and has played the game he loves persistently. Muniz’ birth defect is medically known as Meromelia, which is the lack of one or more limbs such as the hands, or in Gabriel’s case his feet. As mentioned in the video, Muniz has been invited to attend a Barcelona training camp in Saquarema, just outside of Rio, where he will meet some of his soccer idols. The youngster will also get to showcase his skills in Spain as the Barcelona coaching staff, intrigued by his skill and determination, invited him to train with the Catalan Side. Though Muniz may never make a professional team, it’s humbling to witness a youth overcoming obstacles, believing in himself, and disregarding his disability to chase his dreams. Final Thoughts: This story is a breath of fresh air for me as a sports fan. It takes you away from all the high-profile-headlines, big dollar contract talks, rumor-mill trade stories, etc, and lets you view a different side of sports, the inspirational one. Stories like these remind us why we are sports fans. The passion, love for the game, commitment and dedication to a sport, makes up the unwritten code we the fans live by. Hopefully one day, all of those things will help Gabriel Muniz achieve his dream of becoming a professional soccer player. This entry was posted in Everything Else and tagged Barcelona, football, Gabriel Muniz, Meromelia, Rio de Janeiro, soccer, Spain by tsmithbsb29. Bookmark the permalink.